Straight off, I have to admit that this recipe was a bit more involved than my initial impression had suggested, making it unsuitable for the “easy midweek” tranche of my summer baking project, and as a result I screwed several steps up. However, it still came out OK. These bar cookies — from Emily Luchetti’s A Passion for Desserts (Chronicle Books, 2003; p. 64) — are essentially two layers of a rolled-out shortbread surrounding a caramel-nut filling. A majority of tasters liked it, but a significant minority (OK, three people) thought that the filling was far too sweet — although the floral notes from the honey were universally praised. I personally would have preferred a thicker, darker caramel, not to mention construction instructions that gave a precise temperature rather than a qualitative description. 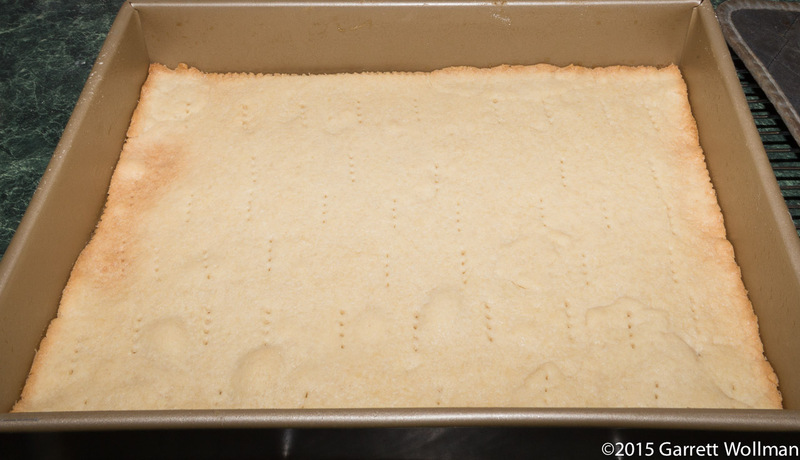 The crust, as I mentioned, is essentially a shortbread: lots of butter (10 ounces or 280 g). 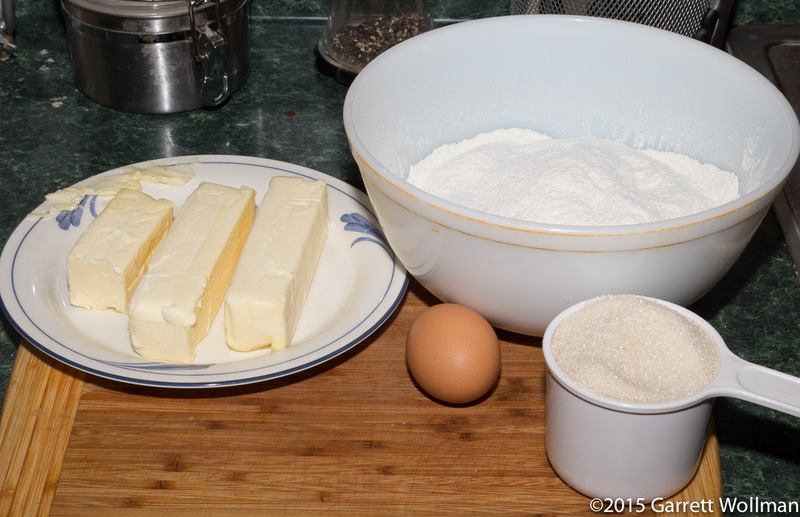 sugar (7 oz or 200 g), and flour (14⅞ oz or 420 g); the butter and sugar are creamed, then an egg is beaten in to provide enough liquid to moisten the flour, and finally the flour itself. Surprisingly, there is absolutely no salt in this recipe, either in the crust or in the caramel — I suspect it could have used some. 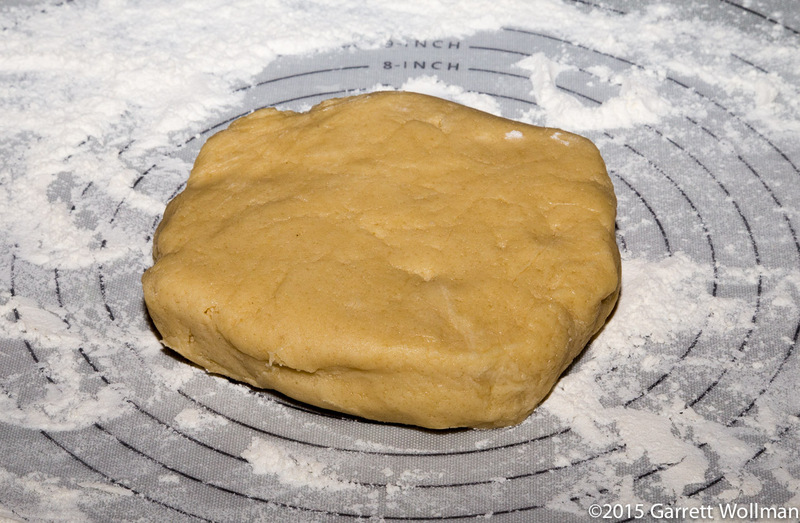 Unlike the typical shortbread, this dough is rolled out like a pie crust — after resting in the refrigerator for the customary half-hour. I found it a bit too soft and fragile after just half an hour, and gave it additional chilling to make it workable. It’s hard to see how the usual press-in method would work for making the top layer, so rolling is probably the best way. I found, however, that rolling a rectangular crust (this dish is baked in a 9×13 pan) is rather more of a challenge than making something round enough to fit a pie plate. The bottom layer is fitted into the lubricated baking pan and docked before baking in a 350°F (175°C) oven for 20 minutes to set. The nut-caramel filling is applied directly on top of the bottom crust. 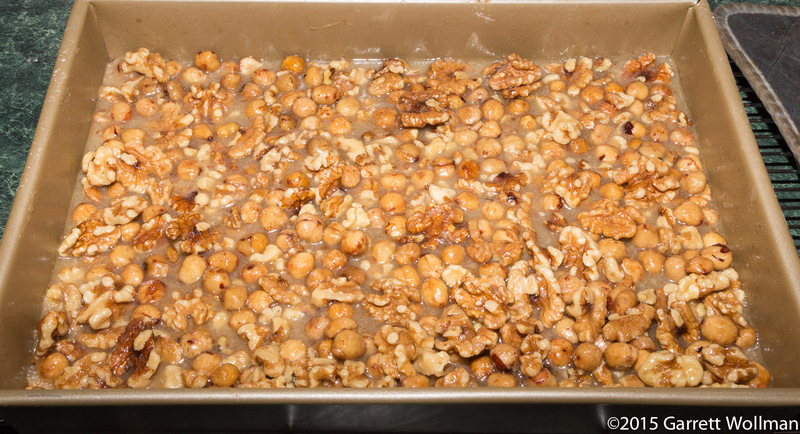 Here is where most of the things I screwed up were: I neglected to chop the walnuts after toasting them — I think they were supposed to be in pieces approximately the same size as a hazelnut — and I didn’t let the filling cool in the mixing bowl as I should have before pouring it into the baking pan. The caramel itself is a little odd, and the recipe calls for strange quantities of sticky, viscous liquids that make me nearly certain that it was scaled down from a larger recipe: who would ever write a recipe calling for five teaspoons of corn syrup (or water or honey)? The other ingredients in the caramel are 10½ oz (300 g) of granulated sugar, 1¼ tsp of lemon juice, ½ cup (120 ml) heavy cream, and ⅓ cup (80 ml) milk. The finished caramel is mixed with 1 lb (450 g) of toasted nuts — I suspect you could use pecans, macadamias, or any other nut that’s sufficiently soft. After spreading the caramel-nut mixture on top of the bottom crust, the top crust is laid on top and brushed with an egg wash before returning to the oven for another 20 minutes. 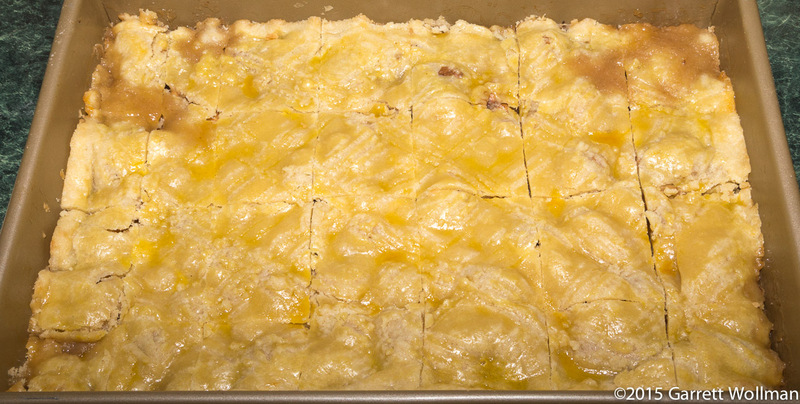 Luchetti recommends a yield of 32 bars from this recipe. I didn’t manage to get quite there; I initially cut it into 24 rather uneven quadrilaterals, but then decided to cut the biggest column in half, giving the 28 bars seen here. I took the whole pan to work with me, as I expected the caramel to be messy, and used a rubber spatula to lever the bars out of the pan for service at the lunch table. Once about half of them were gone, it was clear that the caramel had set up sufficiently to transfer the remaining bars to paper plates and take the pan away to be washed before someone could damage the non-stick coating by splitting bars with a sharp knife. 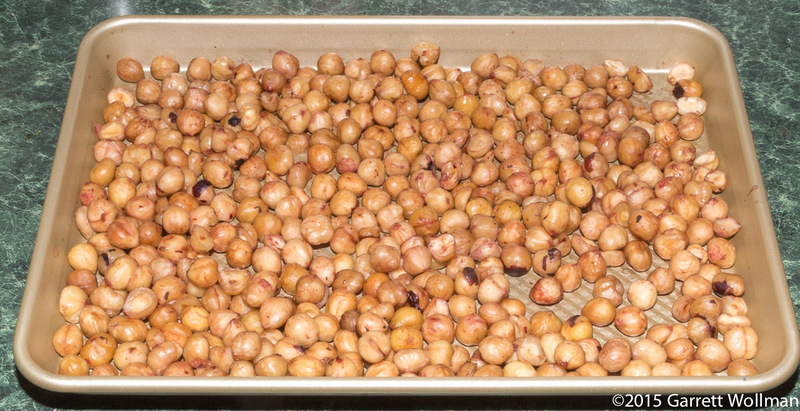 The following computation is based on Luchetti’s published yield of 32 bars per recipe. As pictured, your guess is as good as mine. This entry was posted in Food and tagged bar cookies, caramel, Emily Luchetti, hazelnuts, recipe, shortbread, walnuts. Bookmark the permalink.